Spacious high-tech villa on the Mediterranean coast. Zero to the sea! Limited offer! Only two villas left! A huge high-tech luxury villa on the very shore of the Mediterranean Sea. A very important point: these villas are located within the city line. Such options are very rare in the North Cyprus real estate market, so we recommend to consider this offer. Villas are located in Catalkoy, just 8-10 minutes drive to the center of Kyrenia. 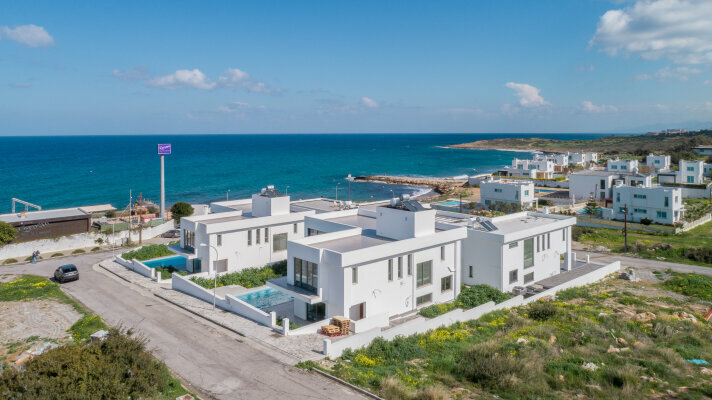 There are only two villas available for sale now: villa standing on the first line for 850,000 GBP, and another one - behind the first one, for 750,000 GBP. panoramic glazing and a huge swimming pool.